Iraq is experiencing one of the largest internal population displacements in the world. Since the beginning of the year, the UN estimates as many as 1.2 million people have been uprooted due to fighting between insurgents from Islamic State of Iraq and the Levant (ISIS), local Sunni tribes, Shia militias and the Iraqi Security Forces (ISF). According to the UN Assistance Mission for Iraq (UNAMI), more than 7,000 people have been killed in acts of terror or violence in the last six months and more than to 13,000 injured. In the month of June alone, UNAMI recorded 2,417 deaths and 2,287 injuries. That is the highest month casualty rate since 2007, the peak of Iraq’s sectarian civil war in the aftermath of the 2003 US-led invasion. The capital Baghdad has seen the most bloodshed with suicide bombers and gunmen targeting busy marketplaces and restaurants, as well as checkpoints and government buildings. But over the past 18 months, attacks have taken place all over the country, though mostly in the provinces of Nineveh, Salaheddin, Diyala, Babel and Kirkuk. Anbar Province, the scene of active fighting between insurgents and ISF, as well as aerial shelling, has also seen high casualty numbers. Aid agencies are now scrambling to support the newly displaced - many of whom are caught up between fighting factions - and humanitarian access is difficult. IRIN has been reporting on the displacement crisis since it began in the western province of Anbar. Here, we take a look back at how the country unravelled. US troops exit Iraq after more than eight years of occupation, leaving behind a government led by Shia Prime Minister Nouri al-Maliki. Sunnis and Kurds also hold key positions but Sunnis claim from the offset they are marginalized. Iraqi authorities issue an arrest warrant for the country's Sunni Vice President Tariq al-Hashemi, accusing him of operating death squads. The decision is criticized as politically motivated. Al-Hashemi’s Al-Iraqiya parliamentary bloc (representing most of Iraq's Sunni community) withdraws from parliament, accusing al-Maliki of monopolizing power. Al-Hashemi, long in exile, is found guilty of running death squads, and sentenced to death in absentia. The verdict fans sectarian tensions across the country. Iraqi counter-terrorism forces raid the home of Sunni Finance Minister Rafi al-Issawi in Baghdad and arrest five of his bodyguards sparking anti-government protests and sit-ins in Issawi’s native Anbar Province. The anti-government protests quickly spread to Salaheddin and Nineveh provinces. Several fatal clashes occur between demonstrators and ISF; bomb attacks become more frequent. The Government moves to shut down Sunni-led protest camps in Anbar, claiming they are breeding grounds for extremists, resulting in major clashes. Al-Maliki orders the arrest of Ahmed Al-Alwani, an influential Sunni member of parliament (MP) from Anbar who is also a leading member of the protest movement. A number of his family members and security staff are killed in the raid and several others wounded. Sunni tribal leaders in Anbar call for government forces and the police to leave the cities of Fallujah and Ramadi, and they do, fearing bloodshed. Militants from ISIS active across the border in Syria, enter Anbar in numbers, exploiting the vacuum left by the retreat of ISF. They claim control of the cities of Fallujah and Ramadi and say they are liberating Sunnis from the Shia government. ISF attempts to retake the cities of Fallujah and Ramadi, sealing off the main entry and exit points to try to cut off supplies for the militants. This creates a siege-like situation with those inside the cordon left struggling for food, fuel and medicines. Humanitarian agencies struggle to get their supplies through to those in need and many people choose to leave to escape the shortages and ISF bombardments. The UN warns of an “escalating humanitarian crisis” after 70,000 people flee in the space of a few weeks and conditions inside Fallujah and Ramadi become more and more difficult. 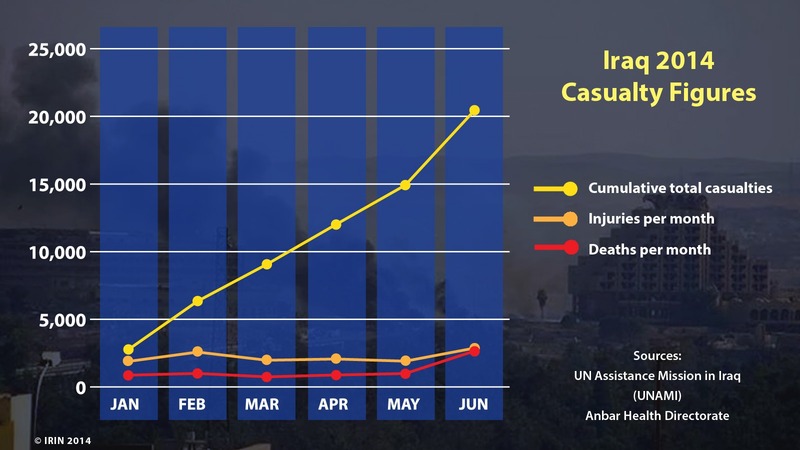 The casualty toll over the course of the month, according to the UN, is 140 deaths in Anbar, and 733 elsewhere in Iraq, in addition to 1,889 injuries. The government responds to ISIS’s presence in Anbar with aerial bombardments and shelling. Families continue to stream out of Fallujah and Ramadi, scattering across the province, seeking shelter in mosques and unfinished buildings. The UN estimates 220,000 people are displaced. Those with some savings head to the semi-autonomous region of Kurdistan to stay with relatives or in cheap motels. The casualty toll over the course of the month is 298 deaths in Anbar and 703 elsewhere in Iraq, in addition to 2,579 injuries. By early March, some 415,000 people are on the move, according to UN agencies. The UN launches a funding appeal for US$103 million to support its response effort, warning that the insecurity is spreading out of Anbar and that more people could soon be affected and displaced. Iraq reports its first case of polio for 14 years, sparking country-wide immunization campaigns though fighting in Anbar limits access. By the end of the month, 156 people are dead in Anbar and 592 elsewhere in Iraq, in addition to 1,975 injuries. Militants from ISIS close a floodgate on the Euphrates River just south of Fallujah causing major flooding across agricultural land in Anbar and into Abu Ghraib, west of Baghdad. Thousands are displaced, the water destroying homes, schools, farms and businesses and posing a major threat of disease. Iraq holds its first general election since the departure of US troops. Sectarian tensions flare and campaigning is marred by daily suicide attacks and bombings taking place across the country, including many in the capital Baghdad. Analysts start to question whether Iraq is heading back to civil war. Al-Maliki wins the most seats in the election and while it does not give him an absolute majority, his tally dwarfs any of his nearest rivals. Months of political wrangling begin as coalition positions take shape. The response to UNAMI’s financial appeal is poor. Agencies start to warn that without more funding, they may have to scale back their response to the displaced in Anbar. By the end of the month, 135 people are dead in Anbar and 750 elsewhere in Iraq, in addition to 2,066 injuries. The situation in Anbar continues to deteriorate. Human Rights Watch reports that civilians are being targeted by government forces using crude weaponry such as barrel bombs. Families fleeing Anbar say they are too scared to register with the authorities. Protection concerns grow for the displaced population, which is now at 435,000. By the end of the month, 195 people are dead in Anbar and 799 elsewhere in Iraq, in addition to 1,908 injuries. On 5 June, ISIS launches a string of major attacks across several fronts in a bid to seize areas and buildings in the provinces of Salaheddin, Nineveh and Diyala. One day later, major clashes and casualties are reported in Mosul, Iraq’s second largest city, in Nineveh Province, between ISIS and ISF. By 10 June, ISIS has full control of Mosul, its airport, military bases and government buildings after a full retreat by ISF soldiers and police officers. The fighting sparks a mass exodus out of the city with reports of as many as 500,000 people fleeing in just days. Long queues of cars clog all the checkpoints coming into Kurdistan and aid agencies and local charities rush to the border to supply water and basic support to those waiting. Temporary transit camps are set up by the checkpoints to provide shelter for those coming through. Buoyed by its successes in Mosul, ISIS moves into Salaheddin Province and takes control of the city of Tikrit, freeing hundreds of prisoners from jail and seizing airports and other key buildings. ISF retaliates with aerial shelling. The city’s main hospital is damaged and a Médecins Sans Frontières clinic is also hit. Elsewhere, hospitals struggle with electricity and drug shortages and many medical staff also flee. Over the coming days fighting intensifies in Samarra and Tikrit cities in Salaheddin Province, in Tal Afar in Nineveh Province, and across Diyala Province, with tens of thousands of people fleeing their homes, many heading north towards Kurdistan. Aid workers strain to support the influx. Coordination capacity and government policies are tested to the limit. Reports emerge that ISIS has carried out mass executions of in Mosul and Tikrit. In response to the ISIS-led Sunni uprising, Shia militias also start to mobilize and Grand Ayatollah Ali al-Sistani, Iraq’s pre-eminent Shia religious figure, urges Iraqis to volunteer to defend the country against ISIS. Amnesty International claims it has evidence of “extrajudicial executions” of detainees by government forces and Shia militias in the Iraqi cities of Tal ‘Afar, Mosul and Ba’quba. UNAMI launches a fresh appeal for funding on 26 June to support the 1.2 million people who have been displaced since the turn of the year. On 27 June, the International Organization of Migration complains roadblocks by the government and militants are blocking aid access and calls for urgent humanitarian corridors to be able to meet those in need. As of 28 June, the cities of Mosul, Tikrit, Tal Afar, Beiji, Quayyara, Sinjar, Suleiman Bek, Rashad, Hawijah, Riyadh, Fallujah and Saqlawiyah, are all under control of armed opposition groups. On 29 June, ISIS spokesman Abu Mohammed al-Adnani declares the formation of an Islamic caliphate via an audio statement posted online. A few days later, ISIS leader Abu Bakr al-Baghdadi calls on Muslims worldwide to come to the new “caliphate” and take up arms. By month’s end, 2,661 people are dead across Iraq and another 2,875 are injured, bringing the total death toll since the beginning of the year to 7,162, in addition to 13,292 injuries. On 1 July, Shiites fail to name a prime minister to replace al-Maliki during the first session of Iraq's new parliament, lowering the chances of an early national unity government that could steer Iraq back on track. The same day, Saudi Arabia pledges $500 million to the UN to help the displaced in Iraq.